Near the end of May 1942, the first evacuees began to arrive at the relocation centers. Most came directly from the WCCA assembly centers, although a few arrived from other places, as shown in Figure A. Evacuees had been assured that the WRA centers would be more suitable for residence and more permanent than the hastily established assembly centers. They also believed that at the new camps some of the most repressive aspects of the assembly centers, particularly the guard towers and barbed wire, would be eliminated. All things considered, they were prepared for an orderly, cooperative move. Source: U.S. Department of the Interior, WRA, The Evacuated People: A Quantitative Description (1946), p. 8. They begin to file out of the bus, clutching tightly to children and bundles. Military Police escorts anxiously help and guides direct them in English and Japanese. They are sent into the mess halls where girls hand them ice water, salt tablets and wet towels. In the back are cots where those who faint can be stretched out, and the cots are usually occupied. At long tables sit interviewers suggesting enlistment in the War Relocation Work Corps. . . . Men and women, still sweating, holding on to children and bundles, try to think. . . . Interviewers ask some questions about former occupations so that cooks and other types of workers much needed in the camp can be quickly secured. Finally, fingerprints are made and the evacuees troop out across an open space and into another hall for housing allotment, registration and a cursory physical examination. . . . In the end, the evacuees are loaded onto trucks along with their hand baggage and driven to their new quarters. . . . It was not an auspicious introduction to the War Relocation Authority. formulate and effectuate a program for the removal, from [designated areas] of the persons or classes of persons designated . . . and for their relocation, maintenance, and supervision. Eisenhower faced an initial decision that would shape the rest of the WRA programwould the evacuees be resettled and placed in new homes and jobs, or would they be detained, confined and supervised for the duration of the war? He had been given almost no guidance on this crucial matter. Beyond the fact that the military would deliver the evacuees to the WRA and thereafter wished no further part in the "Japanese problem," nothing had been decided. The incarceration of the Japanese for the duration of the war can only end in wholesale deportation. The maintenance of all Japanese, alien and citizen, in enforced idleness will prove not only a costly waste of the taxpayers' money, but it automatically implies deportation, since we cannot expect this group to be loyal to our Government or sympathetic to our way of life thereafter. Only when this process failed to resolve all questions did the Committee envision the creation of resettlement communities. We have not contested the right of the military to order this movement, even though it meant leaving all that we hold dear and sacred, because we believe that cooperation on our part will mean a reciprocal cooperation on the part of the government. The WRA's own plans were in sympathy with such an approach, but the government's experience with voluntary relocation suggested that the WRA would only be successful if it could enlist the help of the interior state governors. WRA arranged a meeting for officials of the ten western states for April 7 in Salt Lake City, the day after Masaoka had sent Eisenhower his appeal for a cooperative relationship with the government. From the federal side, the two principal representatives were Bendetsen and Eisenhower; from the states came five governors and a host of other officials, as well as a few farmers who were anxious to employ evacuees for harvesting. Bendetsen made the first presentation, describing the evacuation and the WDC's reasons for it. He argued that, although some evacuees might be disloyal, once they were removed from the West Coast, the danger would be minimal. There were two real problems, as he saw it: possible fifth column activity in the event of an invasion and the possibility of confusing the Japanese Americans with the enemy; both problems were peculiar to the West Coast. Eisenhower then described his planned program. He assured state participants that security precautions would be taken. Evacuees would not be permitted to own land against the wishes of the state, and the WRA would insure that evacuees did not become permanent residents. He played down the portions of the plan involving private employment. The governors of the mountain states fully grasped the politics of the situation, and they were unimpressed by both Bendetsen's sophistry and Eisenhower's social engineering. They opposed any evacuee land purchase or settlement in their states and wanted guarantees that the government would forbid evacuees to buy land and that it would remove them at the end of the war. They objected to California using the interior states as a "dumping ground" for a California "problem." People in their states were so bitter over the voluntary evacuation, they said, that unguarded evacuees would face physical danger. Governor Herbert Maw of Utah put forth a plan whereby the states would run the relocation program with federal financing. Each state would be given a quota of evacuees for which it "would hire the state guards, and would set up camps of Japanese and would work them under general policies and plans specified by the Federal government. The evacuees could not be allowed to roam at large, said Maw, citing strategic works in Utah. Accusing the WRA of being too concerned about the constitutional rights of Japanese American citizens, he suggested that the Constitution could be changed. WRA had to move quickly in finding centers to house 120,000 people and in developing policies and procedures for handling the evacuees soon to come under its jurisdiction. The President had stressed the need for immediate action;  both the War Department and the WRA were anxious to remove the evacuees from the primitive, make-shift assembly centers. The sites were indeed unattractive. Manzanar and Poston, selected by the Army, were in the desert. Although both could eventually produce crops, extensive irrigation would be needed,  and Poston's climate was particularly harsh. Six other sites were also arid desert. Gila River, near Phoenix,  suffered almost as severely from the heat. Minidoka and Heart Mountain, the two northernmost centers, were known for hard winters and severe dust storms. Tule Lake was the most developed site; located in a dry lake bed, much of it was ready for planting. Topaz was covered in greasewood brush. Granada was little better, although there was some provision for irrigation. The last two centersRohwer and Jerome in Arkansaswere entirely different. Located in swampland, the sites were heavily wooded, with severe drainage problems. Table 2 lists the location and capacity of each center. Having selected the sites, the WRA's second job was to develop the policies and procedures that would control the lives of evacuees. This was begun almost immediately, with help from the JACL. In his April 6 letter to Eisenhower, Masaoka set forth a long list of recommendations for regulating life in the camps and stressed, among other things, the importance of respecting the citizenship of the Nisei, protecting the health of elderly Issei, providing educational opportunities, and recognizing that the evacuees were "American" in their outlook and wanted to make a contribution to the war effort. The first set of policies issued May 29 were labelled by the Director "tentative, still fairly crude, and subject to immediate change." Further, they did not reach the centers until three weeks after the first groups had arrived. They were not clarified until August, when over half the evacuee population had been transferred to the centers. Given the limited time available and the novelty of WRA's task as both jailer and advocate for the evacuees, it is not surprising that the agency was not fully prepared. Still, the fact that WRA was not able to provide dependable answers to basic questions about how the centers would be managed probably fed the disaffection that increasingly characterized reactions to the relocation centers. The confluence of diverse political interests had again conspired against the evacuees. The new centers at which they were arriving were barely an improvement over the assembly centers they had left. The increased freedom and possible resettlement they had anticipated had been reversed in favor of confinement. And the rules that would govern their lives were uncertain or non-existent. I can remember the foreman's comment when he found cracks in the building. He said, "Well, I guess those Japs will be stuffing their underwear in there to keep the wind out." Room sizeabout 15 by 25, considered too big for two reporters. For some evacuees the camps were an improvement over the assembly centers. As at the assembly centers, one result was that evacuees were often denied privacy in even the most intimate aspects of their lives. The WRA walked a fine line in providing for evacuees' basic needs. On the one hand was their genuine sympathy for the excluded people. On the other was a well-founded apprehension that the press and the politicians would seek out and denounce any evidence that evacuees were being treated generously. WRA's compromise was to strive for a system that would provide a healthy but Spartan environment. They did not always succeed, and it was usually the evacuees who suffered when they failed. In January 1943, after accusations that evacuees were being coddled, the WRA adopted new policies which showed that their fear of adverse publicity had overcome any humanitarian impulse. "At no time would evacuees' food have higher specifications than or exceed in quantity what the civil population may obtain in the open market." Centers were ordered to submit their planned menus for each 30-day period to Washington for advance approval to make sure that the public was adequately informed of WRA feeding policies and procedures. Perhaps the best that can be said of the meal system is that no one starved. There were, however, some positive aspects to the system. Most of the centers stressed preventive health care and set up immunization programs as soon as possible. The camp hospitals were nearby, although reaching them might be a problem with no transportation but walking. Care was free, and evacuees had time to attend to their health. One of the many unresolved issues for arriving evacuees was the extent to which they would be required to support themselves. Were they in fact prisoners for whom the state had an obligation to provide continuing minimal help? Or were they simply to be regarded as people who had moved, responsible for themselves, for whom WRA would provide initial help and encouragement? Eisenhower's original plan tended toward the latter view. The WRA would, in the main, help provide or locate opportunities for the evacuees, not regard them as indefinite dependents. Once the decision had been made that evacuees were to be confined, however, WRA expectations had to change. Evacuees confined to government camps would definitely have limited career opportunities. Still, the WRA was not prepared to regard evacuees as wards of the state. The WRA, determined to strive for communities that would be as self-sufficient as possible,  wanted to avoid creating a permanently dependent population like the Indians. They believed that prolonged idleness would deepen the evacuees' feelings of frustration and isolation. Further, the war effort demanded that all labor be used, and WRA believed constructive work would rehabilitate evacuees in the eyes of their countrymen. Therefore, the WRA approach to employment (as to many other issues) became a compromiseexpecting and encouraging evacuees to work while denying them freedom of choice or incentives to perform. Needless to say, the result satisfied no one. This plan set the amount of "cash advances," which eventually became "wages." On March 23, before any policy had been adopted, a Hearst newspaper ran a story alleging that evacuees "will be paid much more than the American soldiers fighting the country's battles overseas." The evacuees, it reported, would get $50 to $94 a month, while the soldier's base pay was $21 a month. This misleading story led to a Congressional investigation and attendant publicity that put great pressure on Eisenhower. Eventually he agreed that evacuee pay would not, under any circumstances, exceed the base pay of a soldier; the scale adopted was $12 a month for unskilled labor, $16 for skilled labor, and $19 for professional employees. Congress and the press had delivered a message parallel to that of the mountain states governors: the WRA might look on its work as returning to normal life a group against whom there were no charges and most of whom were concededly loyal to the United States, but a great many members of Congress and the press saw WRA as warden of a dangerous group whose subversive potential required stern control. As a result, most of WRA's constructive programs were defeated by measures of compulsion or deprivation. Evacuees in centers would receive food, shelter, medical care and education without charge. Evacuees working at the centers would be paid $12, $16 or $19 a month. The wage scale immediately became controversial and remained so. Public opinion dictated that wages should be low. Evacuees demanded a higher scale; they saw themselves as victims of a misguided, hysterical war reaction and utterly undeserving of treatment different from that of other Americans. Moreover, the system caused severe financial hardship. Evacuees could not afford to meet even their minimal needs inside the centers. Sometimes the barest essentials in the Sears catalogue, such as shoes for the children, were out of reach. Meeting their outside obligations, such as mortgage payments, was impossible unless they already had savings or income-producing property. And it was insulting. A WRA librarian received $167 a month, while her evacuee staff received $16 a month. Despite the agitation, the system was never changed. By the time it might have been, the WRA was encouraging evacuees to leave the centers and did not want to create an incentive to stay. Despite these problems, the employment program was not a total failure. The centers were staffed almost completely by evacuees, and some agricultural efforts and war industries succeeded moderately. At all centers, workers were most needed in operationsfood preparation,  winterization,  health and sanitation, security  and the like. Feeding the community was most labor-intensive. Among those who testified about their employment, by far the largest group worked in center operations. We began manufacturing with a meat grinder and a washing machine. I recruited my friends and acquaintances (Messrs. Yamaguchi, Shimizu, Asakawa, Harada, Tsuruoka, and Mrs. Umezawa). There was some controversy regarding our spending too much money. So we instituted an invoice system with the administration. We invoiced all the tofu and bean sprouts delivered to the mess halls in the three camps. We also contra-accounted the receipt of raw materials, and the salaries of the members of the tofu factory. We showed a profit at the end of the first month. Our invoices were later to be a problem. The administration made inquiries in various cities regarding the prices of bean sprouts and tofu. They apparently felt our paper profits were too high. However, complaints were voiced by civilians in the cities that our prices were too low. Once the tofu and bean sprout operations were running smoothly, our group looked for other projects. In response to the unavailability of fresh flowers for funerals, weddings, and gatherings, we decided to manufacture artificial flowers. We purchased crepe paper and wire on a retail basis from Phoenix. We soon realized the crepe paper prices were exorbitant, and wrote to the manufacturer. We began buying enough crepe paper to be awarded the sole distributorship for the Pacific Southwest. My friends later sold crepe paper to the retail stores in the Phoenix area. We also started a greeting card manufacturing business, using linoleum block prints. The cards were designed and executed by artists among the internees. Living in a relocation camp meant waiting, not just waiting for food and facilities, but waiting to see what would happen next. There was no way to prepare for the futureto plan for retirement or to choose a career path. There was little reason to work, except to pass the time or to fill immediate community needs. Choices were denied, from the choice of where to live to the choice of what to eat. Merely surviving was physically and psychically draining. Getting to the messhall on time; finding an empty shower; keeping the diapers clean; coping with the heat, the cold, insects or snakes were major tasks. Holding the family together without privacy or authority required a full commitment. Yet the camps were busy places. Most of those who could work, did so, and both WRA and the evacuees clearly tried to create the illusion of a normal community with normal pastimes. Nowhere was this more evident than in their efforts to set up community activities. Yet the same contradictions within WRA applied here as in other aspects of living. How could they provide enough without being accused of providing too much? How could they permit evacuees to control their communities without compromising their responsibilities as jailers? The illusion that the captive population controlled their own lives could not be sustained. Once again, compromise satisfied no one. With no exceptions, schools at the centers opened in unpartitioned barracks meant for other purposes and generally bare of furniture. Sometimes the teacher had a desk and chair; more often she had only a chair. In the first few weeks many of the children had no desks or chairs and for the most part were obliged to sit on the flooror stand up all day. Linoleum laying and additional wall insulation were accomplished in these makeshift schoolrooms some time after the opening of school. At some centers cold waves struck before winterization could be started. Education was a high priority in the centers, but adverse conditions took a toll. Many evacuees believed that deficiencies in the educational program have handicapped them ever since,  both because the physical environment was poor and because evacuees' attitudes toward the centers colored their attitudes about education. At some centers, block managers were the real channels of communication. Generally appointed by the project director (except at Manzanar, where block managers were elected) and usually a respected Issei, the block manager had three specific responsibilities: to ensure that evacuees had necessities; to supervise maintenance of grounds and structures; and to transmit official WRA announcements and regulations. They were paid the going wage of $16 a month. Many of these individuals enjoyed a measure of patriarchal respect that gave them authority  within the community and allowed them to lead when the community councils could not. The guards have been instructed to shoot anyone who attempts to leave the Center without a permit, and who refuses to halt when ordered to do so. The guards are armed with guns that are effective at a range of up to 500 yards. I asked Lt. Buckner if a guard ordered a Japanese who was out of bounds to halt and the Jap did not do so, would the guard actually shoot him. Lt. Buckner's reply was that he only hoped the guard would bother to ask him to halt. He explained that the guards were finding guard service very monotonous, and that nothing would suit them better than to have a little excitement, such as shooting a Jap. A few weeks later the Wakasa case stirred up the center. An elderly resident was shot and killed within the center area inside the fence, by a guard in one of the watchtowers. Particulars and facts of the matter were never satisfactorily disclosed to the residents. The anti-administration leaders again started to howl and the rest of the residents shouted for protection against soldiers with guns. Two-thirdsthe younger, American-born and American-citizen Niseiare becoming increasingly bitter, resentful and even sullen. As tension grew, anyone perceived as close to the administration became suspect as an inu or dog. At Manzanar, a group called the Black Dragons surfaced, a handful of profascist enthusiasts for Imperial Japan. Among other activities, the Black Dragons instigated rock-throwing at the camouflage-net workers  and beat those they considered inu. Other gangs, too, were involved in beatings. As the leave program got under way, draining the centers of many of the most constructively aggressive young men,  the gangs grew. The role of the analysts and the question of whether cooperation with or resistance to the WRA, passive or active, was the better course for evacuees, remain matters of intense, sometimes bitter controversy among those who lived in the camps. There is no "right" answer to the evacuees' dilemma; nor do isolated examples of informing prove or disprove WRA's intentions. In both cases, the facts are almost impossible to determine. For the Commission to delve into these matters, attempting to settle old scores, would be inappropriate. Even as Eisenhower decided in April 1942 that the WRA would plan primarily in terms of confining the evacuees, the process that would secure their release was beginning. Before the first evacuees reached the relocation centers, the WDC had begun to release a few for one of two purposes: to continue their college education or to harvest crops. At my first opportunity, in March, 1943, I left camp to attend school in Milwaukee, Wisconsin. On my way to Milwaukee, I was harassed by MPs checking for my ID number and pass many times. I even got spat upon by some of the passengers on the train. When I arrived in Milwaukee, I discovered that the engineering school had misrepresented themselves and only wanted my money. Then I moved to Chicago, Illinois and with the help of American Friends Service Committee, found a job in a box factory. I worked there for three months. Although the WRA tried to ensure that employers made clear the conditions in which evacuees would be working,  they were not always successful. The new rules, which became effective on October 1, 1942,  over WDC objections,  stopped far short of opening the center gates. They allowed both Issei and Nisei to apply and provided three kinds of leave: short-term leave for up to 30 days (for example, for medical purposes); work group leave (for seasonal employment); and indefinite leave for employment, education or indefinite residence outside the relocation area. To obtain indefinite leave, which was in fact relocation, a person had to show that he had a means of support and that no evidence in his files (either at the center or after a check by the FBI) showed that he might endanger national security. He needed to show his presence was likely to be acceptable where he planned to live, and to agree to inform WRA of any change of address. Special provisions applied to aliens of enemy nationality who were issued leave permits. In his autobiography, Myer states that when these relocation regulations were issued, key WRA staff members were convinced that such a leave policy was essential for a number of reasons: discriminatory segregation would discourage loyalty; "wide and enforced deviation from normal cultural and living patterns might very well have lasting and unfavorable effects upon individuals, particularly children and young people;" the WRA had an obligation to the evacuees and to the people of the United States to restore loyal citizens and law-abiding aliens to a normal useful American life" with all possible speed; confinement in centers bred suspicion of evacuees; and continued confinement would help foster a new set of reservations similar to Indian reservations. This was the voice of that side of WRA which saw itself as the advocate of Japanese American interests, but, as usual, that voice did not speak clearly. The program conveyed the message that all Japanese were supposed to be under armed guard unless the government permitted otherwise, and even those released were granted only "indefinite leave." At least in theory, the government retained its control. By the end of 1942, the WRA was firmly committed to a program of leave and resettlement. Manpower demands were growing, and the agricultural and student leave programs had gone well. Conditions in the camps were deteriorating. The evacuees were becoming increasingly disaffected and the original plans for large-scale agriculture and industry within the centers had been largely abandoned. 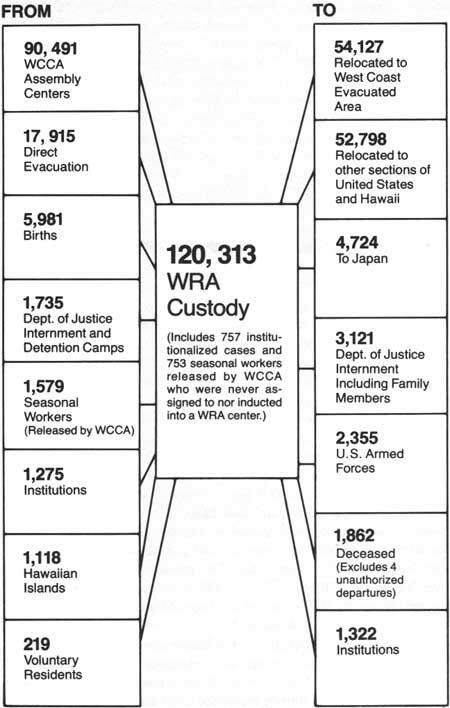 Although the indefinite leave programs had not been particularly successful in resettling large numbers, the WRA was committed to getting evacuees out of the camps and into the war effort.